Quentin Coldwater has lost everything. Once a King in another land - he is now just another lost soul back in New York - searching for a way back to his friends, life, anything that will give him meaning. He attends a secret meeting in a run down bookshop where there is the usual group of magician wannabe's hangers on and some possible actual talent. He even recognises one - Plum, former talented student from Brakebills - the one who started all the latest trouble for Quentin. The meeting is to hire some talented magicians for a heist for an important object. For most people in that dark room that the meeting is being run by talking bird might startle - but Quentin has lived in Fillory where that is quite normal. What is more unusal is that the bird has no idea where the object is, but does know it is protected by the most effective magic that has ever existed. They will all be paid well but could die in the attempt. This the third and final part of the Breakbill's saga. I guess you can't start here - so you will have to read the previous two, or at least the first one. Quentin in desperation has been back to where it all began - teaching at Brakebills Preparatory College of Magic. No more thrones for him, just a small room, daily routines and some good wine to drown his sorrows. When your heart is broken funny how you turn to a job in teaching. Now you know why teachers look so miserable most of the time. Meanwhile back in Fillory, Eliot and Janet, the King and Queen of the magical land discover the whole world they inhabit is dying. They embark upon a quest to save it as anarchy grows and people start fighting each other. Even though it is the end of an epoch - the tone seems lighter than before and all the creatures come alive with a fantastic energy. 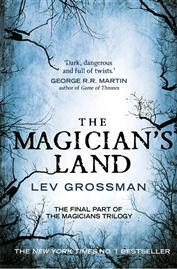 Although I was disappointed by the second volume on the series and found it deeply depressing - Lev Grossman has found the strength to complete the triolgy with wit and style. We go deeper into Fillory and it mechanics, whilst Quentin, no long the ingenue is the cynical, yet hopeless romantic haunted by his former lover Alice, now a demon, whom it seems would like to kill him. The Magician's Land is darker, but crammed full of events and it is great to once again visit Brakebill's South and experience the power of whales. The theme of loneliness crops up time and again. Plum is a great and adept new face and I like that the magic she and Quentin make together has shape and power and is hard to handle. This is magic for adults now - and all the better for it.